I love pinning on Pinterest. Recently I received notification from Pinterest about the removal of one of my pins. 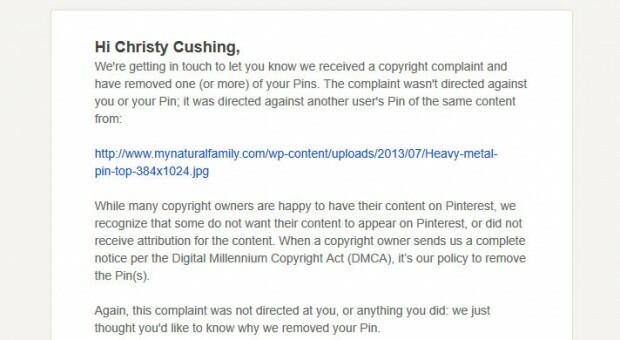 The company informed me that a copyright complaint was received and that the person or company promoting the content was told to remove it from both Pinterest and their website. The email notice I received from Pinterest informed me about “When a copyright owner sends us a complete notice per the Digital Millennium Copyright Act (DMCA), it’s our policy to remove the Pin(s).” The DMCA was passed by Congress in 1998 to reduce internet plagiarism and online copyright infringement. As creators of content ourselves, we appreciate social media platforms like Pinterest proactively dealing with copyright complaints and informing their users about the process.